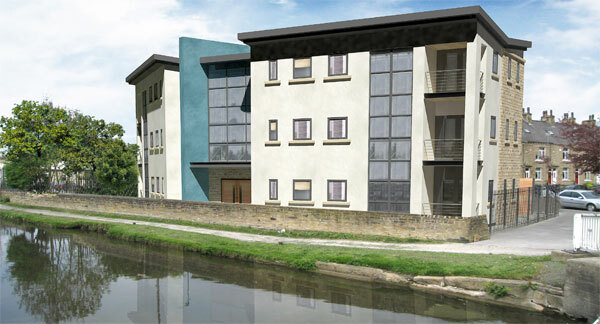 Our brief for this project was to provide the client with a full architectural and interior design service for a contemporary residential scheme on a fairly restricted site next to the Leeds-Liverpool canal in Shipley, West Yorkshire. The previous single storey building occupying the site is to be demolished as it’s life is expired. 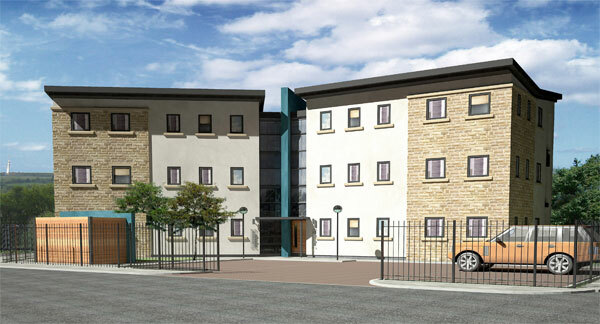 The site is located just inside a conservation area, which meant that a parallel conservation application needed to be submitted along with a full planning application, however, after some initial correspondence with Bradford Council’s Planning Department it was considered that a contemporary residential scheme would be the most suitable development for the site, particularly given the nature of other similar recent developments in the immediate vicinity. The proposal comprises 2 blocks of three storey accommodation which is split by a central glazed circulation core and blue feature wall. A mix of render and stone has been used for the external walls, although a more vertical emphasis has been placed on this. Each apartment features 2 bedrooms and a large open-plan living aspect.